Why do Corals bleach ? 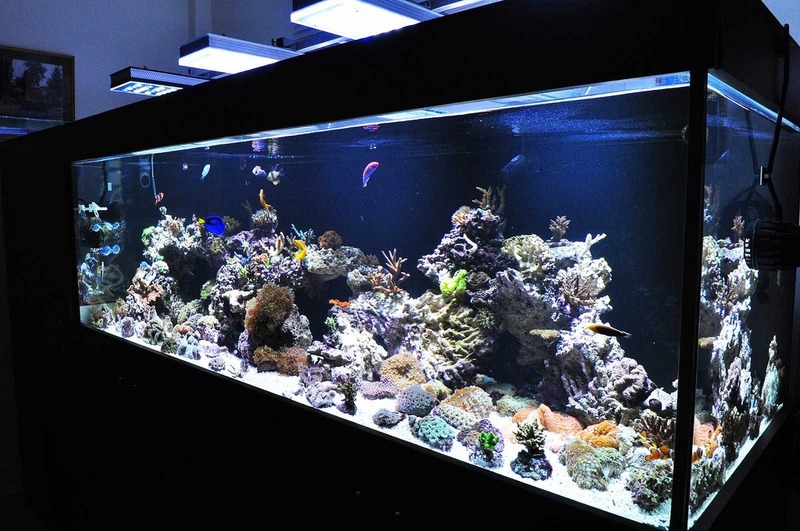 How long have you been in the marine aquarium hobby or research work? Which type or family of corals do you or have you maintained? Do you mix Euphyliids, Mushrooms and Zoanthids containing palytoxins (Genus Palythoa) with other coral? If so, what size aquarium are they in? What types of filtration (including protein skimmers/brand name and model) do you use? What are your preferred levels of salinity, pH, dKH, calcium, and magnesium? Do you employ automated dosers, and if so, what do you automatically dose? How often do you test your water and which tests do you perform? What are your usual results? Which supplements do you regularly dose? With the exception of calcium, magnesium, and alkalinity buffers, which other supplements do you dose and why do you feel they are beneficial? Do you regularly feed your corals, if so, what is your preferred food or foods? Do you incorporate a refugium, algae scrubber, or DSB? Describe your present lighting system in your display tank, brand, Kelvin temperature and photoperiod used. Which brand(s) of salt and supplements do you prefer and why do you feel that that brand or brands are more beneficial than others? Do you use aquarium controllers and/or electronic water testing equipment? How often are water changes performed and what percentage? Do you employ carbon dosing to control nitrates and phosphates, and if so, what method do you use. Have you ever experienced coral bleaching in your aquarium(s)? If yes to the above, what did you feel may have been the cause? Were you able to reverse the process, and if so, how did you accomplish this? What would you suggest to other aquarists to prevent coral bleaching? What size is your display tank? Before we begin, a short word about RTN (Rapid Tissue Necrosis) and Zooxanthellae (Symbiodinium). Rapid Tissue Necrosis is often referred to as the “White Syndrome” and appears as white bands or patches of tissue loss which generally affects Acropora Corals. RTN is a fast acting contagious condition where coral tissue sloughs off the skeleton of the coral. A loss rate of up to 10cm per hour will result in the death of the colony in less than 24 hours, but this of rapid death is rare in our captive systems. The only effective cure that Orphek is aware of is by removal of diseased colonies and fragment branches at least 26mm ahead of any affected area. After cutting the diseased colony off, it is recommended to seal the cut with Cyanoacrylate glue (Super Glue). Symbiodinium. The Genus Symbiodinium is made up of the largest and most prevalent group of endosymbiotic dinoflagellates known to science. These unicellular algae reside in the endoderm of tropical Cnidarians such as corals, sea anemones, clams, and jellyfish where they relocate products of photosynthesis to the host and in return receive inorganic nutrients. They are necessary for coral to thrive and grow. We will begin with a statement from Arjen Tilstrea, a Marine Biologist. “From experience, I know that not many aquarists actually know what bleaching is. Bleaching is the loss of zooxanthellae and/or photo pigments, NOT the loss of coral tissue. Most aquarists call a white skeleton a bleached coral but it is not. When corals bleach they still have their tissue around their skeleton and can eventually die if they are not re-infected with new zooxanthellae. A coral can survive for a couple weeks in a bleached condition. I don’t think aquarists can really point out what causes bleaching in their tanks because there are too many factors that can influence and induce bleaching (temperature, light, water flow, nutrients etc.). I have never experienced bleaching in my previous tanks, I have experienced RTN (rapid tissue necrosis) though. In response to the survey, contributors were; Tanne Hoffe, Adrian Flynn, and Moshe Gur Arie who together have a combined total of 42 years of experience growing corals. Their responses to individual questions are compiled below. 1. 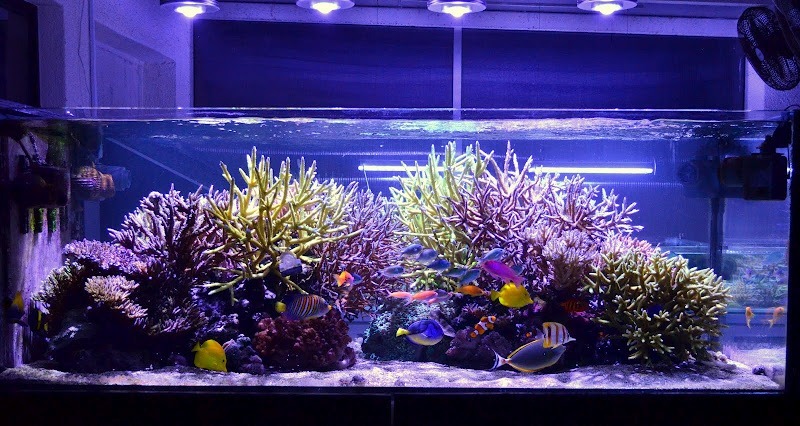 How long have you been in the marine aquarium hobby or research work? About 22 years hobby, teaching/studying biology about 12 years. 2. Which type or family of corals do you or have you maintained? 3. Do you mix Euphyliids, Mushrooms and Zoanthids containing palytoxins (Genus Palythoa) with other coral? If so, what size aquarium are they in? In the past also zoanthids, but my angelfish do regard these as food, so I can’t keep these anymore. I do still keep mushrooms and Euphyliids with sps etc. Tank volume now (total system) about 200 gallons, in the past I also did this in smaller systems, about 50 gallons. I use some activated carbon to decrease levels of toxins/terpenes. 4. What types of filtration (including protein skimmers/brand name and model) do you use? Royal Exclusiv BK200, a few days each month some (1 coffee cup on 200 gal) activated carbon, iron based phosphate remover if needed (prefer small doses exchanged more often in order to avoid sudden changes in water chemistry). 5. What are your preferred levels of salinity, pH, dKH, calcium, and magnesium? 6. Do you employ automated dosers, and if so, what do you automatically dose? Yes, Balling salts as needed (1 vessel NaHCO3, 1 vessel calcium chloride, magnesium chloride, strontium chloride in ratio as needed) and trace elements (Grotech Corall ABC, 2-3 ml daily). This is easier than dosing by hand, but most important, levels are much more consistent, as the doser splits up the set amounts in 12 separate dosings spread over the day. 7. How often do you test your water and which tests do you perform? What are your usual results ? About 3 times each month. Results: Ca 400-420, KH 6-8, Phosphate: 0,03 or less, nitrate: about 1 mg/l. 8. Which supplements do you regularly dose? 9. With the exception of calcium, magnesium, and alkalinity buffers, which other supplements do you dose and why do you feel they are beneficial? corals and I see positive results in Goniopora’s, kaliumjodidefluoride: increased blue/purple colouration in sps, mainly in Acropora and Montipora. 10. Do you regularly feed your corals, if so, what is your preferred food or foods? A few times each month, I use FaunaMarin Ultramin F, Ultramin S and Ultraclam in a mixture. I see positive results in the coral’s health, mainly in LPS corals. The corals probably also catch some fish food every now and then. 11. Do you incorporate a refugium, algae scrubber, or DSB? 12. Describe your present lighting system in your display tank, brand, Kelvin temperature and photoperiod used. 1 x Orphek PR156 (11.30-21.30: white and blue leds, 10.00-22.00 only 4 blue leds). The combination of HQI with fluorescent (T5) was my preferred combination for the last 17 years, but both on the aesthetic and on the biological side, I am very happy to have switched to Orphek led (not to mention the electricity bill…). The tank improved a lot since I made this switch! 13. Which brand(s) of salt and supplements do you prefer and why do you feel that that brand or brands are more beneficial than others? salt as I’ve never seen any reverse reactions the last 15 years I use it, I have seen negative reactions with some other brands. 14. Do you use aquarium controllers and/or electronic water testing equipment? Controllers/testers: timers, automated top off, ORP meter, thermometer, automated chiller. 15. How often are water changes performed and what percentage? About 2 x each month, about 17% each time. 16. Do you employ carbon dosing to control nitrates and phosphates, and if so, what method do you use ? In the past I did try some methods, but the tank consumes all nitrates. Phosphates are removed with iron based absorber if needed. 17. Have you ever experienced coral bleaching in your aquarium(s)? 18. If yes to the above, what did you feel may have been the cause? month (went on holiday…) and all tissue receiving direct light was either bleached or dead. 19. Were you able to reverse the process, and if so, how did you accomplish this? Move the coral to a darker spot stopped the bleaching, recover took long as algae already covered the dead branches. 20. What would you suggest to other aquarists to prevent coral bleaching? reactions when placing or moving corals. Keep water parameters at safe levels and use bulbs of the right spectrum and intensity. the coral can catch bacterioplankton (for example: zeovit-like filter or biopellets in fluidized bed-filter). Otherwise, add fine food and/or feed the fish a lot. In my experience, many people underestimate the amount of food their fishes need (and their system can handle). Another way of keeping the coral’s health safe in a (very) nutrient-poor system is to add amino acids or nitrates so the coral can use these for their zoöxanthallae’s metabolism. Some successful German coral farmers aim for ‘zero’ phosphates, but top the nitrates up to 10-15 mg/l! I do feed the corals directly, but I don’t need a lot of food. I am able to keep about 40 fishes in my 200 gallon system without taking extreme measures to keep the water quality high. All fish are well fed (including 4 tangs, 3 angels, 8 anthias…) and the corals thrive as they use the waste products of the fish as their food source. It’s all about keeping a healthy balance in input/output/metabolism in the ecosystem of the system. Understanding the biochemistry of your tank helps a lot to prevent problems! Also, try to avoid sudden changes in the water chemistry, even if the changes are having a positive influence ‘on the numbers’ give the animals time to adjust. Corals from the reef flat often are exposed to sudden changes (rain, tides) in nature, but corals from water deeper than say 2-3 meters often have problems with rapid changes. 21. What size is your display tank? Display tank is 190 gallons(gross), with a sump of about 40 gallons (net) and a small species tank tied to the system of about 7 gallons. 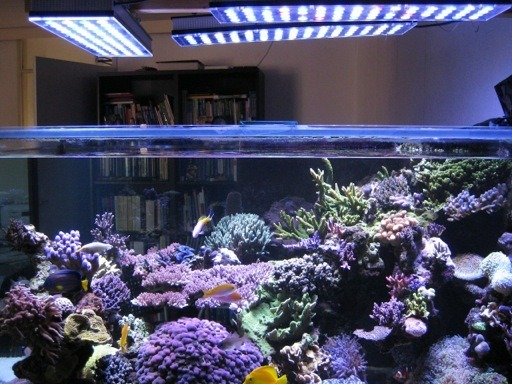 How long have you been in the marine aquarium hobby or research work? 10 years in the hobby. Which type or family of corals do you or have you maintained? Mostly SPS for the last 5 years. Do you employ automated dosers, and if so, what do you automatically dose? Yes but only to supplement the shortfall of my CARX unit, I add sodium carbonate and calcium chloride which I prepare myself. How often do you test your water and which tests do you perform? What are your usual results. Sometimes twice a day for alk, only because if I see my carx drip rate is off, otherwise a must weekly. I test for dKH, calcium, and magnesium. Results as per point 5. Which supplements do you regularly dose? Lugols Iodine, after lights out 12 drops…that’s it. With the exception of calcium, magnesium, and alkalinity buffers, which other supplements do you dose and why do you feel they are beneficial? As per point 8, my skimmers will remove this element, it’s the most volatile in terms of shelf life within your tank. So must be dosed daily. Also my chaeto and ATS removes a lot of this element, coral color suffers if low…can see it in montipora, first sign they go dull color, extreme is burnt tips in some sps. Do you regularly feed your corals, if so, what is your preferred food or foods? Never had the need nor saw the value if I added or stopped….My belief is u simply adding more nutrients to your tank. I believe in feed fish heavy, their poop dissolves and that fuels the coral with what they need to eat. Do you incorporate a refugium, algae scrubber, or DSB? Oh yes all three, and biggest I could possibly fit in. Which brand(s) of salt and supplements do you prefer and why do you feel that that brand or brands are more beneficial than others? I uses Seachem Reefsalt, and Tropic Marin Lugols Iodine. I take what ever is cheap for me and Seachem does the job well. Do you use aquarium controllers and/or electronic water testing equipment? I have a Profilux ex3…though I’m not using it close to its potential! Do you employ carbon dosing to control nitrates and phosphates, and if so, what method do you use. Used to…stopped for a long while now…tank looks better without. I run Rowaphos as well, but really don’t need to as my Hanna Checker tested a perfect 0.00ppm, BEFORE me adding the Rowaphos. Chaeto does the best phosphate remover job ever. Have you ever experienced coral bleaching in your aquarium(s)? I came close when I started with by sunlit project as I was not aware of the power of the sun, I now use 40% shade cloth and even in peak summer corals do get stressed. Because of the sun using halides or LED, these have never been a danger to me as their PAR output is nothing close to the sun on a clear noon day! If yes to the above, what did you feel may have been the cause? Excessive par (1000+) by the sun, coupled by high water temps 29+ degrees centigrade. Were you able to reverse the process, and if so, how did you accomplish this? Yes, add shadecloth and move coral to shadier spot. 1. How long have you been in the marine aquarium hobby or research work? It’s my fifth year. 2. Which type or family of corals do you or have you maintained? All types (soft, LPS, SPS). 3. Do you mix Euphyliids, Mushrooms and Zoanthids containing palytoxins (Genus Palythoa) with other coral? If so, what size aquarium are they in? Yes, my tank is 200X70X60 cm – L,W, H.
4. What types of filtration (including protein skimmers/brand name and model) do you use? The protein skimmer is Deltec SC-2060, occasionally mechanical filtration with a 200 micron bag but generally without. 5. What are your preferred levels of salinity, pH, dKH, calcium, and magnesium? SG – 1.025, pH – 8.3-8.5, dKH – 8, calcium – 410, magnesium – 1300. 6. Do you employ automated dosers, and if so, what do you automatically dose? Only for the alkalinity. 7. How often do you test your water and which tests do you perform? What are your usual results. I do most of the tests once every 2 weeks. These are the 5 main ones: Nitrate, phosphate, calcium, alkalinity and magnesium. My nitrate is usually 20-40 ppm and the phosphate is 0.3 ppm. The high values are because of too many fishes in the tank… There are 40 (I love to see fishes in my tank along with corals). 8. Which supplements do you regularly dose? Alkalinity, calcium, magnesium. 9. With the exception of calcium, magnesium, and alkalinity buffers, which other supplements do you dose and why do you feel they are beneficial? I was advised to put Lugol’s and I dose 4 drops 3 times a week. I don’t dose other supplements. 10. Do you regularly feed your corals, if so, what is your preferred food or foods? I feed my corals with my fishes and lately started to use a new special coral’s food that was developed in my country (Israel) in a coral’s farm. 11. Do you incorporate a refugium, algae scrubber, or DSB? Only macro algae in my sump. 12. Describe your present lighting system in your display tank, brand, Kelvin temperature and photoperiod used. I use 3 Orphek Nilus 18000K. They start gradually from 09:00 (10%, blue only) to 23:00 (40%, blue only). Full light (100% white + 100% blue) is between 14:00 and 20:00. 13. Which brand(s) of salt and supplements do you prefer and why do you feel that that brand or brands are more beneficial than others? I use Royal nature salt (made in Israel). I have no answers to the rest of the questions. 14. Do you use aquarium controllers and/or electronic water testing equipment? Yes, I use the Seneye Reef but only in the last month. However, I have controllers for temperature, for the water level and for the wave makers (Vortech). 15. How often are water changes performed and what percentage? I perform 2.5% water change each week. I do it by taking out water through the skimmer. This way is in the last 3 months only. 16. Do you employ carbon dosing to control nitrates and phosphates, and if so, what method do you use. I use the biopellets in a reactor. 17. Have you ever experienced coral bleaching in your aquarium(s)? Yes. 18. If yes to the above, what did you feel may have been the cause? It’s hard to tell but it looks like parasites most of the times. There are times that I have 2 of the same coral’s family on the same rock and very close to each other, one is in full flourish and the other one is bleached out. Also, moving coral can cause a stress that leading to bleaching. 19. Were you able to reverse the process, and if so, how did you accomplish this? Sometimes I cut the good part and it survives. 20. What would you suggest to other aquarists to prevent coral bleaching? I have no idea. 21. What size is your display tank? 850 liters(about 220G). All respondents have a relatively large aquarium. All incorporate very good and efficient protein skimmers. All keep calcium, dKH, and magnesium at very close to the same levels. Only one respondent had a bleaching issue with one coral. And MOST importantly, all respondents use Orphek high PAR/PUR LED Lighting which provides the ideal spectrum that corals best respond to. We can see from the above information that one of the best ways to reverse coral bleaching is by using lighting of the proper intensity and spectral curve that corals respond to and Orphek LED lighting can and will provide this. If other lighting technologies are used, lamp replacement will usually reverse this effect. If you are using the proper lighting and photoperiod, look at your water parameters and adjust if necessary. Since most species of corals we keep produce 90% of the food they require, lack of phytoplankton or other coral foods is rarely an issue. Orphek is aware that it would be difficult to pin point any root cause for bleaching based on four responses, so Orphek would like to invite you to respond to this survey. Your responses will be posted in the comment section of this blog. Your valued input will aid in making reef keeping more successful.